Los Pandos comes after Meredith Wilder’s 2017 recording The Immoralist. As listeners recall, Wilder made Burque her home through 2016, fronting the folk rock ensemble Wildewood whilst in residence in good old Dirt City. The Immoralistmarked a turning point in Wilder’s career; she now works outta Colorado and recorded this new EP while working as an artist in residence at the Helene Wurlitzer Foundation in Taos. “Cranesbill Geranium,” is a haunting affair that drifts and shimmers right in front of you before slipping away on the wind. Wilder’s cover of Patsy Cline’s “She’s Got You” transforms echo-soaked, adolescent doo-wop into a forlorn, shoegazy anthem that I am 100 percent certain woulda thought was being sung by Kim and Kelley Deal had I heard it anywhere else but Bandcamp. The intense intricacy of the last track confirms Wilder as an essential voice in this world and el norte too. Singer/songwriter Kristina Jacobsen calls singer/songwriter Meredith Wilder the “Songbird of the Sandias.” It’s an appropriate moniker, given the appealing sweetness in Wilder’s voice, the transparency of her head tones, and her irresistible melodies. 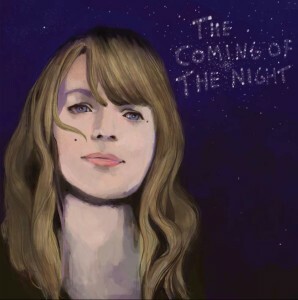 But there is also a dusky darkness and a wary vulnerability in both voice and lyrics that balance the sweetness and draw you deeper in to The Coming of the Night, a solo album from the frontwoman of the popular band Wildewood. The material could well have found its way onto a Wildewood album. About half of the tunes were written with the band in mind, says Wilder. But with the band members preoccupied with other projects and the next Wildewood recording session unscheduled, Wilder found herself sitting on an album’s worth of songs written over the last two years and decided she couldn’t sit on them any longer. laconic guitar front and center. The musical palette is deftly expanded on a handful of tracks with one or more of Michael Shu (violin), Ryan Wienpahl (harmonica), and Sage Harrington (vocals). Harrington recorded and mixed the album and found exactly the right sound to carry the heft of Wilder’s songs. Could Wilder be the love child of Loretta Lynn and Leonard Cohen? Her songs have some of Lynn’s country heartache and grit, and like Cohen, she’s befriended desperation, having recognized it as a fellow traveler in the human condition. She also has the determination of each to resist self-delusion and endure the sweet ache of life. I won’t pretend that after a couple of listenings, I’ve deciphered the meaning of all of Wilder’s lyrics, but three things are sure: First, they are bulging with intimations, and I suspect meanings will tumble out over time. Second, they are beautifully matched to the melodies. Third, even only partly deciphered, they give the listener a glimpse deep into the songwriter’s heart. Lyrics aside, Wilder communicates deeply with her melodies and her voice. I’m fairly convinced that if she were singing in Urdu, the effect would be much the same. Just listen to the fluttering, thready head-tone plea when she sings the word “Why” on three successive choruses in “Cold-Hearted Lady.” The song’s steely self-assessment melts under that desperate questioning. After hearing The Coming of the Night, I’d also hate it if she weren’t writing songs. Wildewood will be appearing at the Outpost on March 5, sharing the bill with the Merlettes, the all-female honky-tonk band.